A veteran of 34 years in this family-owned business, Carlos Gascot says he enjoys the close relationships with the (McCombs) family and the employees at McCombs Supply. 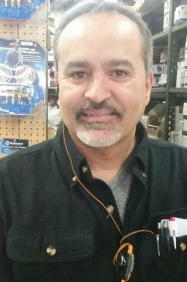 Carlos is the go-to guy for many customers, as he has a knack for solving problems and finding an alternative part when McCombs' does not have the exact appliance item in stock. He often fields HVAC questions. Away from work, Carlos enjoys watching NASCAR and football and going fishing. His favorite food is spaghetti. If he did not work at McCombs, Carlos laughs and says he would be a UPS driver, "'Cause I almost had that job but turned it down and came here."